When battered Lacey Shannon staggers into the Altamira Police station and begs Deputy Luke Prescott to “Put Jordy in a cell, then I’ll talk,” he’s eager to do so. Jordy Clements heads up the crews from Clements Construction, who are building a tunnel through Altamira’s mountains to the Pacific Coast Highway, giving access to Cole Graydon’s Altamira Lodge. Their presence is currently turning the little city into a boomtown that, to Luke’s mind, isn’t all that good since it’s bringing in undesirable elements and the crewmembers have more or less taken over. While he’s gone, however, Lacey disappears. Soon after, the owner of Graydon Pharmaceuticals calls with orders to let Jordy go. Since Cole’s the man more or less holding the power of life or death over Luke’s girlfriend Charlotte Rowe, he has no choice but to obey. Raised by serial killers who murdered her real mother, Charley’s present life can be summed up in two sentences. Luke is still suspicious of Cole’s real intentions toward Charley. Luke may have released Jordy, but the story doesn’t stop there. A flash drive Lacey left behind holds proof that Jordy isn’t merely a construction boss, but is actually a terrorist, ordering explosives for the mountain demolition that are in reality intended for targets around the country. Cole reacts accordingly. He may commit some less than savory acts and use his money and power to get things done but he won’t let his company be used in such a way. Luke, however, feels this threat has brought him to a turning point. Luke is about to get his wife. He and Charley will become involved in a plot that has a far greater reach than Altamira and even worse repercussions than the serial killers she and Cole Graydon target. Its consequences will either destroy their relationship or strengthen it beyond belief. If one reads only the first third of this second entry in the Burning Girl series, he might think it’s merely a rehash of Charley and Cole bringing justice to more victims of the serial killers managing to stay under law enforcement’s radar. Once Luke comes into the picture with his arrest of Jordy Clements, the focus changes completely and the reader is off on a chase to divert and prevent a multiterrorist attack while examining the way in which the main characters rationalize their guilt. In spite of the many concessions he makes for her benefit, Cole Graydon has Charley Rowe under his thumb. He’s the man owning Zypraxon, the drug illegally given her, making her into a superwoman vigilante. He’s also keeping the man who gave her the drug alive, a promise he made to Charley in order to get her cooperation in bringing about his plan. The story emphasizes Charley and Luke’s relationship, as well as how they are connected to Cole. It also gives the reader more insight into Cole’s inner workings, revealing him as a contradictory man with an unusual though strict moral code, committing crimes with the justification that in the long run, his actions should bring about a greater good. He’s a man for whom the reader will gradually experience a reluctant flicker of sympathy through never much admiration. 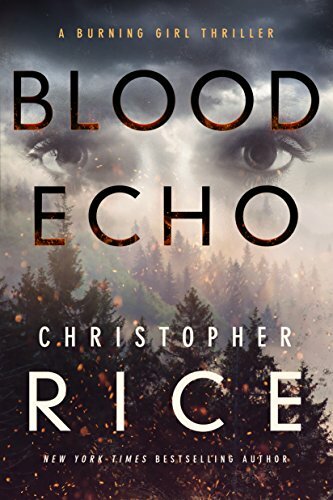 Christopher Rice has written a suspense -filled, forceful second entry in his series, a well-balanced thriller with deep-delving characterizations. Blood Echo is filled with a complex cast of characters imbued with both good and evil, as well a good man who walks the thin line between.